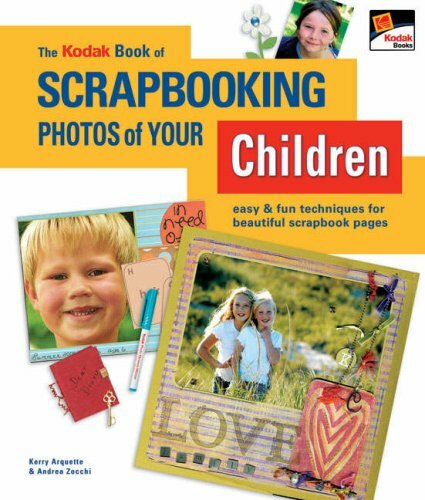 A review of The KODAK Book of Scrapbooking Photos of Your Children: Easy & Fun Techniques for Beautiful Scrapbook Pages by Kerry Arquette and Andrea Zocchi. I have been curious for awhile what these Kodak books would be like, so I broke down and ordered one. I have to say that I was a little disappointed by this one...I was sure to purchase one of their most recent publications (January of 2007), but still the products and the layouts themselves seemed a little dated. Another thing that I didn't care for is that there were no product listings (maybe because they were so dated), but when I did find a paper or something I liked, I had no way to tell what it was...kind of a bummer.